A group of 200 disgruntled foreign workers went on a seven-hour sit-out on Monday morning in Tampines over a dispute of unpaid salaries. Instead of starting work at 8 am, Bangladeshi workers from Sunway Concrete Pte Ltd and TechCom Construction gathered in an empty field at Tampines Industrial Street 62. Sunway is the main contractor and Techcom is the sub-contractor hired by HDB to fabricate building materials for flats. The workers have not been paid for four months running, since November last year. They were also unhappy about the quality of the food served in the canteen. “All men same problem, all men no pay for four months,” said K. Ravhkumar. According to the 35-year-old, his usual working hours are from 8am to 10pm. However, he said that workers would be made to work till 12 am on busy days, without overtime pay. An average worker earns a basic salary of $18 per day. The strike slowly dissipated at about 3pm as workers were told by representatives of the company that they would receive their November pay today, and their December pay next Friday. It is not confirmed when they will receive their salary for January. According to some workers, it is not the first time the company has fallen behind payments for its foreign workers. Currently, about $150 is deducted each month from their salaries as food expenses, and another $20-50 for utilities. A spokesman for Sunway, who declined to be named, claimed that the sit-out originated from a core group of about 10 Bangladeshi workers. “A few of them took some weapons and threatened the others. Some don’t know what is going on but just joined in…Majority of the workers do not dare to speak because they are scared they will get hamtum (beaten up),” he said. 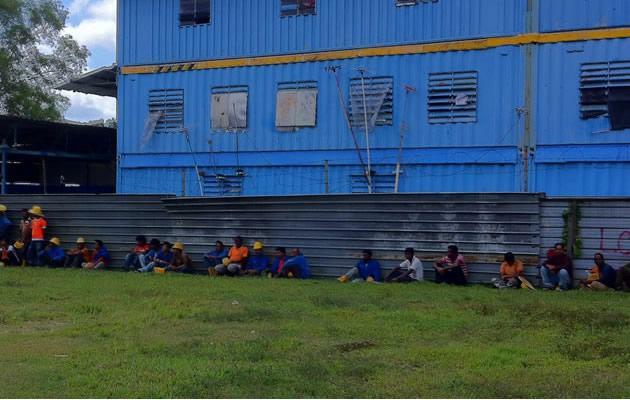 According to a Ministry of Manpower (MOM) spokesperson, its officers responded to the incident immediately after they were alerted by the police and went down to the worksite. MOM’s interim investigations revealed that the employers had not paid their workers since November 2011. MOM understands that by 8pm today (6 February 2012), the employers would have paid out the November 2011 salaries to all the affected workers, with MOM officers present on-site. The employers have also assured MOM that the affected workers will receive their outstanding December 2011 salaries by this Friday (10 February). "MOM will continue investigations here and follow up with the workers to ensure that they receive their December 2011 and January 2012 salaries promptly. MOM officers will also interview workers on other employment-related issues," said the spokesperson. "MOM does not condone employers who fail to pay salaries on time, or fail to upkeep and maintain the foreign workers they have brought in. MOM urges workers to report to MOM early if they have salary arrears." When contacted by Yahoo! Singapore, TechCom declined to comment.